The Meziadin River flows into the Nass River system approximately 180 km from where the Nass flows into Portland Inlet. The known major sockeye producers in the Nass River system include Meziadin, Bowser, Damdochax, and Fred Wright lakes. The Meziadin fishway was constructed to bypass a series of waterfalls known as Victoria Falls. 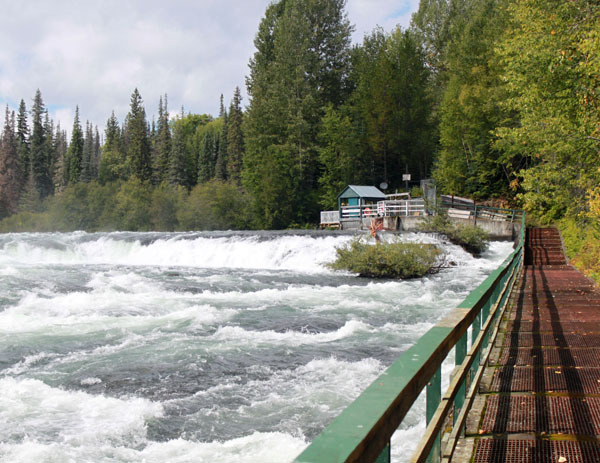 The purpose of the fishway was to provide access to existing spawning grounds above the falls and to provide a method of determining the spawning escapement of sockeye salmon in the Meziadin system. Previous studies in the late 1950’s indicated high fish mortality was occurring due to the inability of the salmon to move past Victoria Falls. Prior to the construction of the Meziadin fishway in 1966, it was thought that the Meziadin system produced less than 40% of the total Nass sockeye return. Since the completion of the fishway it has been discovered that 70 to 80% of the Nass River sockeye run returns to the Meziadin system. The Meziadin fishway was designed either to operate unmanned or to hold enumeration facilities, which are operated by support personnel. Since 1966, the fishway has been manned during each season. Operations usually begin in the first week of July. The exact starting date is determined by water levels, which must be low enough to allow personnel to enter the water and install trap panels at the end of the fishway. The personnel operating the fishway are responsible for the daily counts of returning salmon, biological sampling, water level measurements and camp maintenance. The enumeration continues until early September. Sockeye are also sampled on a daily basis for biological information. The number of fish sampled each day is determined by calculating one percent of the total count from the previous day up to a total of one hundred fish. The fish are dipped from the holding trap, sampled and returned alive to the river.